What is culture? This is something that is so broad, yet so specific that to experience it, is to intimately understand it. One thing that influenced me in becoming a designer is my constant curiosity of wanting to learn about various cultures and see them reflected in an interior environment that engages their community. As a black woman with an Immigrant mother and US born father, culture to me has always been sort of this specific yet untraceable thing. I can trace my Caribbean family back to a certain point in Nevis, but after that it’s a bit of a mystery. And like any Black American knows, your last name is more than likely not your family last name and there is not any traceable immigration paperwork because you know…slavery. So, where does that leave us? How do we as people of color cultivate and sustain culture in this “land of the free?” One way is we start creating. In the past few years there has been so much discussion about how this is the “golden age” of television. How this is the most diversity we have seen on television to date. I am not claiming to know the history of film and television, but I do remember as a kid watching television with my family and 95% of the shows we consumed were pretty diverse. From the Cosby Show to Living Single, my family was able to connect with jokes and content that represented a slice of Black American life. Looking back on that now, I should have known I would go into the design field as I can still visualize every single set piece in those living rooms that became an extension of my home. As we know, culture is spread in so many ways, but the most common and tangible way is through our media consumption. 1) wow their house seems really f*cking expensive! 2) that furniture is really similar to my parents’ furniture. The Cosby Show really changed the television landscape during its era and its influence impacted how we not only thought of the black household unit, but also how we envisioned our homes. I’m sure at some point in time every black household had a replica of the Funeral Procession painting by Ellis Wilson hanging in their entryway. For a brief period of time, my parents started going to antique shows and I remember when they brought home our version of the Funeral Procession painting and my sister and I being like "this looks just like the one in the Cosby Show!". This show, although mired in controversy due to its creator, has influenced Black Art representation and how we choose to highlight our own culture within the home. From The Cosby Show, came a wonderful spin-off and instant classic called A Different World (if you haven't seen it, it's on Netflix!). The idea of a show about black kids going to college was seen as “ground breaking” (*eye roll*) as if we weren't expected to go to college. However, if you look at the trajectory of the kids within the Huxtable household, why wouldn’t they be expected to go to college? I will watch this show on reruns any day of the week! It is hands down still one of my favorite shows, for me there is such a familiarity to a lot of the story lines because it centered on the fictional HBCU of Hillman. Revisiting this show, so many things are so specific to the black cultural experience- from the Pit and its deeply Southern menu, to the housemother in the dorms, to their hilarious take on black Greek life. The show, although not just for black people, highlighted us in a way that was different.. it showed us being scholarly, it showed us having everyday college problems, it showed us as young adults...it showed us in the reality that we know we exist. One of my favorite episodes is “Mammy Dearest.” This is the episode where Whitley, post-failed Dwayne engagement decides to include Mammy in the exhibit for the dorm dedication. This stirs up all sorts of discussions about Mammy as a common American figure, and all the negative racist connotations associated with her. The first time I saw the episode, I remember thinking to myself "what in the entire f*ck, Whitley?!?!". Mammy is an image that many people of color, especially dark skin women, do not have a positive reaction to, so why would she be trying to include her in such a special moment? A few months ago while a friend and I were antiquing (yes, I do this), we came across a booth that had baskets and baskets full of mini Mammies for sale. I immediately walked out and thought about this ADW episode. Specifically because that episode focused on many important conversations that are often minimized in black history when discussing women. Issues of how we as women of color are constantly viewed as caricatures, the complex history with colorism within our own communities and its generational impact on our sisterhoods. A Different World was able to take all these elements and bring about something positive and influential. In the performance piece that highlighted the episode, Kim Reese (played by Charnele Brown) started the performance as Mammy and through the course of Nikki Giovanni’s “Ego Tripping,” she transformed into a beautiful black queen. This episode still resonates with me TO THIS DAY and I know it was because of the creators’ ability to tap into a specific wounds in our culture, she fleshed out important conversations that we need to continue to have in order to heal. 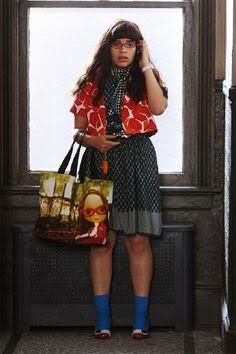 Another show that I was absolutely OBSESSED with was Ugly Betty. If you never watched this show while it was on, definitely take the time to binge on it from the beginning (no one is judging). I loved how Ugly Betty did not fall into the traditional stereotypical trappings in its depiction of the immigrant Latino family. It’s protagonist, Betty Suarez was a first generation Mexican American woman played by the wonderful Latina actress America Ferrera. Betty worked very hard as an assistant to a top fashion editor. Even though she worked in high fashion, Betty remained true to her culture and this was a focal piece of her narrative throughout the course of the show. Often times this was illustrated in Betty’s clothing in which she mixed traditional prints and fabrics with her thrifted items that gave her the quirky sensibility we came to know and love throughout the series. While I absolutely adored the sets of Mode Magazine, I really enjoyed the episodes that spent more time in Betty’s childhood home back in Queens, NY. There was such attention given to the detail within the home and we came to really understand and familiarize ourselves with the Suarez story through the items they put on display. From the rich layering of textiles and patterns, to the framed religious artwork, the Suarez home provided a much-needed glimpse into a different type of home than what is typically shown on network television. By paying such attention to detail they were able to provide a sense of cultural camaraderie with the outside audience. LOOK AT THOSE DETAILS! This familial Latino unit has been further developed and illustrated in one of my favorite shows on TV right now... Jane The Virgin! What I love so much about Jane the Virgin is that it centers on three generations of a Venezuelan family in South Florida. The Villanueva women are all very strong women and are in varying points of their lives journey, but they still find time to reconnect at home. The show is set up like a modern telenovela, but through all the crazy there is a continuous thread of the importance of family and culture. Preserving culture once a family has immigrated is something this show does very well. The interiors of the Villanueva house have such warmth to them that it feels as if you’re getting a huge hug from your abuela every week. Culture is put on display each episode, by encouraging us viewers to really engage with the show through the use of subtitles. The grandmother only speaks in Spanish throughout the show, while other characters that interact with her often flip back and forth between English and Spanish. It is something that many Spanish-speaking Americans know very well. The reality is that cultural duality comes with the territory of being a child of immigrants, but few people are given the opportunity to fully display that culture outside of the home. Jane the Virgin puts culture on display, from the layered interiors of the home to the language; they do not shy away from highlighting their ancestry and this I am totally here for. I think these shows all play an important role in carving out segments of our story and putting it on display for consumption. I love how this access to culture is stirring up conversations about what the minority family looks like and how we move through the world. We have shows like Queen Sugar illustrated so beautifully by the super talented Ava Duvernay that showcase Southern black life in a way that is not about slavery or poverty, but gives a deeper look into how many black families actually live. We also have shows that give a slice of everyday life like Master of None and Insecure. The success of a show like Insecure is “rare” in that it’s a show about black women in LA getting to just be every day women. I can’t recall a show outside of Girlfriends (we still deserve Joan’s wedding!) set in Los Angeles where the focus was on black women and how we inhabit space instead of the extremely rich white families and their beachside communities. The common comment I hear when these shows are discussed are how relatable everything is.. THIS IS CULTURE PEOPLE. Culture makes things relatable. It makes things tangible. When Melina Matsoukas’ camera pans across Issa’s living room in the first season of Insecure, you notice all the little cultural touches only we could understand- like a Frank Ocean pillow or a classic book by a woman of color author. It’s the little things like that that connect us. It’s a silent nod to the viewer that says "we see you, we get you, and we are you." which shows have done a good job at displaying culture? Tell us via twitter !